A sweet and tart frozen treat. To make lemon curd: In a medium saucepan, combine lemonade concentrate and ¼ cup sugar, bring to a boil. Continue cooking for 2 minutes. In a medium bowl, whisk remaining sugar with eggs. Slowly temper lemonade mixture into eggs; whisking a small amount in at a time until all of the lemonade mixture is incorporated. Return mixture to saucepan. Slowly bring to a simmer over medium heat and continue whisking until thick and resembles pudding, about 3 minutes. Strain lemon curd into a medium bowl, place over a bowl of ice water. Whisk butter into lemon curd, stirring every 5 minutes until mixture is reduced to room temperature. Cover with plastic wrap and refrigerate. 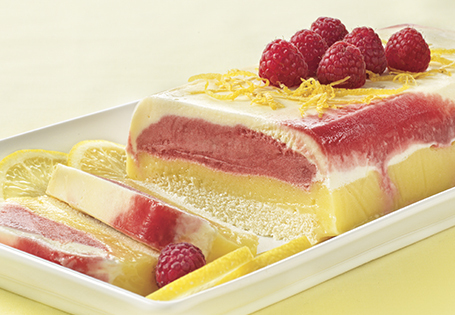 To assemble cake: Line a 1 pound loaf pan with plastic wrap, spread vanilla ice cream on bottom, followed by raspberry sherbet, lemon curd and top with loaf cake slices. Cover with plastic wrap and place in freezer for 2 hours. To serve, invert cake and slice.